On Saturday, I slept in and woke up still pretty phlegmy. I settled in to watch Gameday and some football and decided that when my computer battery died, I would get up and shower to go run my errands. My errands were not that pressing, so I contemplated putting them off until Sunday, but decided some fresh air might make me feel better, so off to the mall I went. I was wandering around Macy's when I heard someone come on the store PA. I wasn't paying attention but the word "karaoke contest" caught my ears quickly enough that I heard the rest of the sentence "and win CMA Awards tickets!" I was looking for an employee to make sure I heard what I heard, when an employee came up to me to ask where I got the shirt in my hand. Ha. I pointed it out to her and then nonchalantly added, "Did I just hear there's a karaoke contest?" She said there was a contest going on downstairs on the first floor but it ended at 4. I looked at my watch. It was 3:30. I decided to try on the shirt (didn't work) then go see what the fuss was about. I got downstairs and texted Jay, my karaoke partner in crime, to see what song I should sing. Now keep in mind, I'm still sick. Normally, karaoke does not scare me, but yesterday I knew I was taking a real gamble on whether or not my voice would participate in this tomfoolery. I decided to roll the dice to the tune of "Midnight Train to Georgia." I was the last singer to enter. Singing at a karaoke bar is one thing but singing in the middle of your local Macy's is quite another. It was awkward but I suffered through. Afterward, to pass the time until 4 pm, two other contestants who had already entered decided to sing again, which had apparently happened a few times during the two hour contest, since there were not that many contestants. Finally it was time to announce the winner. What can I say? Motown never lets me down. It worked in 2004 and it worked again Saturday. My family had very different reactions to my news. My sister asked if anyone else had entered. My mom went berserk, but that was probably more due to me asking her to come up and go with me! I offered to let her bring a friend to go with, since I had the pleasure of attending last year, but she insisted that I come with her. So make sure you tune in. Vince Gill is scheduled to perform and if you think my mom can practice self-control, you're wrong. Who knows what she'll do! On Thursday night, my supper club met again for our fourth gathering but the FIRST gathering at which all six beautiful members were present. Cheers to that! But it almost didn't happen. Yours truly has been under the weather with a sinus infection this week. I took off of work on Thursday to rest, rest, rest. I couldn't decide if I wanted to get showered, fight traffic and go (traffic would not have been an issue if I had been at work) or just skip it altogether. I decided that I would not shower, but I would fight traffic and go, and so all six of us were, in fact, there. 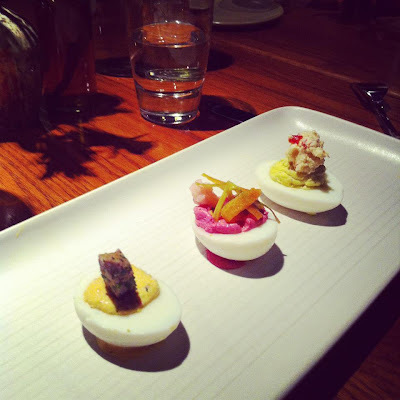 We chose SILO, a new "farm to fork" establishment in Germantown, which is a little area near downtown. They serve "elevated southern cuisine" in a really cool atmosphere and they've only been open since August, so this was a pick we were all excited about. Parking is a little crazy if you don't have cash to tip the complementary valet attendants. You forget about that once you get inside, though. Happy hour ends at 6, and all of us were late due to traffic, so none of us got to take advantage of that. We did all get a drink though, even me on my cough medicine. We ended up with one beer, four wines and one specialty cocktail from the list. -Kale salad, house bacon, sweetened pecans, dried cranberries, apples, mustard vin - this was yummy! Our server said the shrimp and grits and the pork belly are the two most popular dishes. I think the sides must change more than the entrees themselves because I copied and pasted those right off the website and it sounds about exactly the same as what I saw in print last night. There are also five or six side dishes, which are served family style, so it was recommended that we get a few to split. We ended up ordering one bowl of mac and cheese which we all got to nibble on and it was pretty delicious! The prices for the first courses ranged from $5 to $9 while dinner was $13 to $24. They had a lovely dessert menu but we didn't get any dessert this time! We were all too full! Everyone liked her food. We agreed that this might be our second best spot so far, topped only by Mama Myint's crazy house salad. That's gonna be hard to beat but we'll keep trying! Remember how I told you my boss got married recently? I wanted to show you what I made for her wedding present. I saw this on Pinterest a while back and knew it was something I would actually get around to doing one day (unlike all the other things I pin that I just hope will magically appear in my life/closet/stove/home). I ended up not using my boss's wedding invitation for this but rather her wedding program. I bought the ornament at Michael's as well as the charms and ribbon. 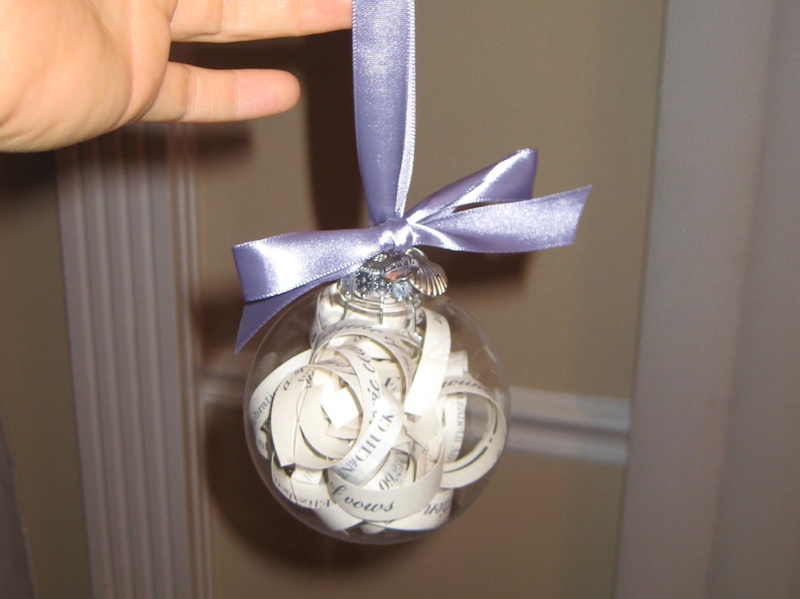 I would think finding ornaments January through August might be tricky so if you like this idea, stock up now. I chose the lavendar ribbon since lavender was her main wedding color. The two charms I chose are a seashell for their honeymoon and a little pendant that says LAUGH because that's all they ever do. Ta-da! Pretty cute, right? 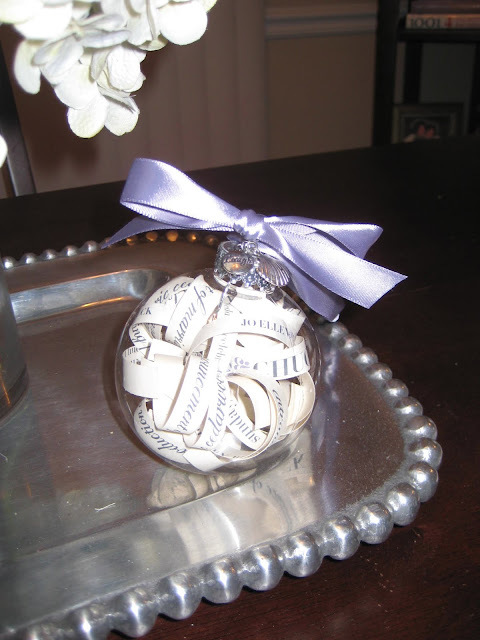 Think of all the occasions you can make into ornaments! We got home in time to grab dinner with the boys, who had stayed at home while the girls were in Auburn, and rest off the sunburn that no one was prepared to get. Not to mention that it went from 85 and sunny to 65 and rainy while we were away, so we were all a little worse for the wear. I curled up with my laptop and watched Jay Z live at Barclays. Similar to his last concert live stream on You Tube, but instead of closing SXSW, he was opening the new Barclays Arena in Brooklyn, AKA the new home to the Brooklyn Nets, the NBA Team of which he is a part owner. Who better to christen the new arena than Hova... AND BEYONCE! She came out for a mini set to give her hubby a break, then joined him for the "Young Forever" finale. CAN I PLEASE BE THEM?! I am obsessed. Look how cute. COME ON. There were more snuggles and giggles and playing on the floor today before we all headed our separate ways. All things considered, it was a fine weekend.